This is a list of commonly used terms and their definitions. This list is not intended to be all inclusive, but rather to provide enough information to familiarize the reader with metal building terminology. A building product that supplements a basic solid panel building such as a door, window, skylight, ventilator, etc. A plan view drawing showing the diameter, location and projection of all anchor rods for the components of the Metal Building System and may show column reactions (magnitude and direction). The maximum base plate dimensions may also be shown. The term "anchor rod" is used for threaded rods embedded in concrete to anchor structural steel. The term "rod" is intended to clearly indicate that these are threaded rods, not structural bolts, and should be designed as threaded parts using the material specified in the latest edition of AISC. The embedded end of the rod may be secured in the concrete by means of a head, threading with a nut on the end, a hook or other deformation, by welding to reinforcing steel or other means. With regard to metal and galvanic response, when two metals are connected in an electrolyte, they will form a galvanic cell, with the higher metal in the galvanic series being the anode. The anodic metal, being more “active” oxidizes first, thus protecting the cathodic metal from corrosion (see cathodic). American Society of Civil Engineers rated steel shape similar to a train track. Placed on top of a runway beam, it acts as a guide for top running cranes. A girder arranged parallel to the main girder for supporting the platform, motor base, operator's cab, control panels, etc., to reduce the torsional forces that such load would otherwise impose on the main crane girder. A supplemental hoisting unit, usually designed to handle lighter loads at a higher speed than the main crane hoist. A corrosion resistant metallic element. Aluminum alloy coated sheet is often used for metal roofing and wall panels. The lower flashing component of a two component metal flashing detail. The component flashing details are often used either for expedience or to allow differential thermal movement between building elements or accessories. The lower component is the “base” flashing; the upper component is the “counter-flashing”. A plate attached to the bottom of a column that rests on a foundation or other support, usually secured by anchor rods. A strip of wood common to non-structural panels that is used to support the vertical ribs of adjacent metal panels. Also referred to as a Bearing End Frame or Bearing Frame Endwall (BFEW). A Bearing Hot Rolled is a structural system consisting of a series of hot rolled rafter beams supported by hot rolled columns connected by a series of pinned connections. Often used as the end wall framing of a building. A small headed pin with expandable shank for joining light gage metal. Typically used to attach flashing, gutter, etc. A structural support projecting to a structural member. Examples are canopy brackets, lean-to brackets, and crane runway brackets. A load lifting system consisting of a hoist that moves laterally on a beam, girder or bridge, which in turn moves longitudinally on a runway, made of beams and rails. The elements of a building that enclose conditioned spaces through which thermal energy is capable of being transferred. A Stand Alone building is any building in a project that does not attach to any other building in the same project. The first building entered in a new project is always a Stand Alone building because there are no other building to which it could attach. A Stand Alone building can be added to the project and located so that it does not interfere with other buildings in the project. Attachment An Attachment is a building which will attach to any other building in the project. An attachment can be a Lean-to, single slope or gabled building. Attachments can be made Endwall-to-Endwall, Sidewall-to-Sidewall, Endwall-to-Sidewall or Sidewall-to-Endwall. The frames of an attachment that is a lean-to must line up with the columns lines of the building to which it attaches. Any other building type can attach to another building anywhere along the wall to which it attaches. A roof covering made up of alternating layers of tar and asphaltic materials or layers (plies) of organic or synthetic fabric. A process of indenting two or more sheets of metal that are pressed against each other to prevent slippage between the metal. A member formed from steel sheet in the shape of a block "C", that may be used either singularly or back to back. That action which causes movement of liquids when in contact with two adjacent surfaces such as panel sidelaps. With regard to metal and galvanic response, cathodic metals are lower (and more noble) in the galvanic series. (May be protected from oxidation by more anodic metals). (See “Anodic”). A C-shaped member formed while in a semi-molten state at the steel mill to a shape having standard dimensions and properties. A sheet metal strip used in concealed fashion to secure panels or flashing that permits some limited degree of thermal response. A resilient strip, formed to the contour of ribbed panels and used to close openings created by ribbed panels joining other components. A main member used in a vertical position on a building to transfer loads from main roof beams, trusses, or rafters to the foundation. A part used in a Metal Building System. See also "Components and Cladding". For wind load considerations, members that do not qualify as part of a Main Wind Force Resisting System. They include girts, joists, purlins, studs, wall and roof panels, fasteners, end wall columns and end wall rafters of bearing end frames, roof overhang beams, canopy beams, and masonry walls when acting as other than shear walls. A hold down clip used with a wall or roof panel system to connect the panel to the supporting structure without exposing the fasteners on the exterior surface. A transition component between a through-wall scupper and downspout used to collect and direct run-off water. A beam of variable geometry passing over two supports with overhang on one end or passing over three supports. The color coating on or self color of the roofing material that gives it a high solar reflectance and a high thermal Emittance. The difference in temperature between the outdoor mean temperature over a 24-hour period and a given base temperature. For example, using a base temperature of 65° F a day with 85° F mean temperature has 20 CDD (85-65=20). The annual Cooling Degree Days are the sum of the degree days over a calendar year. A sheet metal flashing, cut or formed to the contour of ribbed panels and used to close openings created by ribbed panels joining other components. The covering piece on top of an exposed wall or parapet usually made of metal, masonry or stone. It is often sloped to shed water back onto the roof. Formed metal or elastomeric flashing secured on or into a wall, curb, pipe, rooftop unit, or other surface, to cover and protect the upper edge of the base flashing and its associated fasteners from exposure to the weather. This is the section of the building serviced by the crane. The aisle length can run the length of the building (perpendicular to frames) or it can run across (parallel to frames). The width of the aisle is based on the width of the crane bridge unless it is a monorail and then it is simply a line. operations, service buildings, light warehousing, etc. where service requirements are light and the speed is slow. Loads vary from no load to occasional full rated loads with two to five lifts per hour, averaging 10 feet per lift. standard duty bucket and magnet operations where heavy duty production is required. In this type of service, loads approaching 50 percent of the rated capacity are handled constantly during the working period. High speeds are used for this type of service with 10 to 20 lifts per hour averaging 15 feet, not over 65 percent of the lifts at rated capacity. loads approaching a rated capacity throughout its life. Applications may include magnet, bucket, magnet/bucket combination cranes for scrap yards, cement mills, lumber mills, fertilizer plants, container handling, etc., with twenty or more lifts per hour at or near the rated capacity. performing the critical work tasks affecting the total production facility. These cranes must provide the highest reliability with special attention to ease of maintenance features. The principal horizontal beams of the crane bridge which supports the trolley and is supported by the end tracks. A track supporting and guiding the wheels of a bridge crane or trolley system. On underhung cranes, the crane rail also acts as the runway beam. The member that supports a crane rail and is supported by columns or rafters depending on the type of crane system. On underhung bridge cranes, the runway beam also acts as the crane rail. A column that sets under the runway beam and next to frame column with bracing to frame column for lateral support. 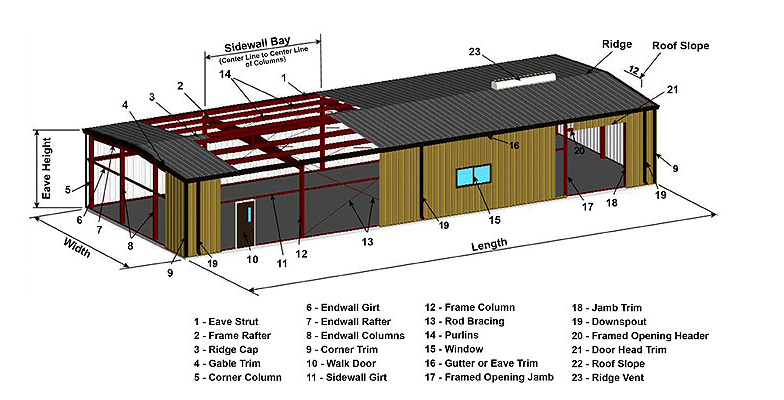 A flat structural element that is fastened to the roof framing members, typically corrugated metal sheets or plywood. It acts as the substrate for non-structural roof panels. The displacement of a structural member relative to its supports due to applied loads. Deflection should not be confused with "Drift". The loads expressly specified in the contract documents that the Metal Building System is designed to safely resist. The temperature at which water vapor condenses in cooling air at the existing atmospheric pressure and vapor content. Cooling air below the dew point will cause condensation. The resistance to racking generally offered by the panels, fasteners, and members to which they are attached. A vertical conduit used to carry runoff water from a scupper, conductor head or gutter of a building to a lower roof level, or to the ground or storm water runoff system. Horizontal displacement at the top of a vertical element due to lateral loads. Drift should not be confused with "Deflection". A metal flashing, with an outward projecting lower edge, intended to control the direction of dripping water and to protect underlying building components. The line that is usually parallel to the ridge line formed by the intersection of the planes of the roof and wall. A structural member located at the eave of a building that supports roof and wall paneling and may act as a strut to transfer bracing loads to frames. The surface area of a building at the edges of the roof and at the wall intersections where the wind loads on components and cladding are greater than at other areas of the building. The area used to determine the wind coefficient. The effective wind area may be greater than or equal to the tributary area. A design concept utilizing the proportional behavior of materials when all stresses are limited to specified allowable values in the elastic range. Bumpers or wheel stops attached to the end of the crane runway to prevent the crane from driving off the end of the runway. These are provided by the rail vendor only. The unit consisting of truck frame, wheels, bearings, axles, etc., which supports the bridge girder(s) and allows movement along the length of the runway structure. The total estimated annual cost for purchased energy for the building, including any demand charges, fuel adjustment factors and delivery charges applicable to the building. A Synthetic thermoset rubber that is popular for membrane roofing and flashings, and as gasketing material for the head of weather sealing screw fasteners. A break or space in construction to allow for thermal expansion and contraction of the materials used in the structure. The manufacturing process performed in a plant to convert raw material into finished Metal Building System components. The main operations are cold forming, cutting, punching, welding, cleaning and painting. An architectural treatment, partially covering a wall, usually concealing the eave and/or the rake of the building. A flexible sheet manufactured by the interlocking of fibers through a combination of mechanical work, moisture and heat. Roofing felts may be manufactured principally from wood pulp and vegetable fibers(organic felts), asbestos fibers (asbestos felts), glass fibers (fiberglass felts or plysheet), or polyesterfibers. A small metal sleeve placed inside a gutter at the top. In residential applications, a spike is nailed through the gutter into the fascia board to hold the gutter in place. The ferrule acts as a spacer in the gutter to maintain its original shape. A standing seam roof system hold down clip that does not allow the roof panel to move independently of the roof substructure. A counterflashing used to cover and/or seal the top of a pipe flashing or other small base flashing at penetrations through the roof. A pad or mat, usually of concrete, located under a column, wall or other structural member, that is used to distribute the loads from that member into the supporting soil. A typical coating weight for galvanized metal sheet. Equates to 0.90 oz. (26g) of zinc per square foot, measured in both front and back surfaces. Other coating weights are G30 and G60. The distance between adjacent lines of fasteners along which pitch is measured, or the distance from the back of an angle or other shape to the first line of fasteners. A proprietary trade name for a coating, used over sheet steel, that is composed of an aluminum-zinc alloyfor corrosion protection. A crane similar to a top running crane except one side of the bridge is supported by one or more gantry legs that ride on a rail attached to the floor, while the other side’s end truck rides on a runway beam. A main horizontal or near horizontal structural member that supports vertical loads. It may consist of several pieces. The reflection of sunlight that can impair vision and create an annoyance. Glare of a coated surface is controlled by the sheen. Low Sheen = Low Glare. "V" shaped reinforcing steel used to transfer shear in the anchor rods to the concrete floor mass. A crane in which the bridge, hoist, or trolley is operated by the manual use of chain and gear without electric power. A diagonal member from the intersection of the column and rafter section of the rigid frame to the eave member to prevent lateral buckling of the haunch. The difference in temperature between the outdoor mean temperature over a 24-hour period and a given base temperature. For example, using a base temperature of 65° F a day with 50° F mean temperature has 15 HDD (65-50=15). The annual Heating Degree Days are the sum of the degree days over a calendar year. A mechanical lifting device usually attached to a trolley that travels along a bridge, monorail or jib crane. May be chain or electric operated. Wheels mounted near the ends of end trucks that roll on the side of the rail to restrict lateral movement of the crane. Steel sections (angles, channels, S-shapes, W-shapes, etc.) which are formed by rolling mills while the steel is in a semi-molten state. details are typically devoid of sealant and rely on water to freely shed over the joints. Hydrokinetic roof details are not to be used on roof slopes below 3:12. A dynamic load resulting from the motion of machinery, elevators, craneways, vehicles, and other similar moving forces. See Auxiliary Loads. Wire mesh used to prevent insects from entering the building through ventilators, louvers, or other openings. A metal cover trim that fits over a panel rib or seam area after it has been cut and bent at a fascia break detail. Maximum safe vertical distance through which the hook, magnet, or bucket can move. Also referred to as "Hook Height"
See "Roof or Floor Live Load". A washer with dimples which flatten when the high strength bolt is tightened. The bolt tension can then be determined by the use of feeler gages to determine the gap between the washer and the bolt head. A description of a class of buildings usually less than 60' eave height. Commonly, they are single story, but do not exceed 4 stories. An assemblage of rafters and columns that support the secondary framing members and transfer loads directly to the foundation. A structural assembly that provides for the overall stability of the building and receives wind loads from more than one surface. Examples include shear walls, diaphragms, rigid frames, and space structures. A steep sloped (almost vertical) real or mock roof element on the perimeter of a building. Originated by the French architect, Francois Mansart. An engineer employed by a manufacturer who is in responsible charge of the structural design of a Metal Building System fabricated by the manufacturer. The manufacturer’s engineer is typically not the Engineer of Record. A written description of the chemicals composing a product, and other information, such as safe handling and emergency procedures. In accordance with OSHA regulations, it is the manufacturer’s responsibility to produce an MSDS and the employer’s responsibility to communicate its contents to employees. A connection designed to transfer moment as well as axial and shear forces between connecting members. A method of placing concrete grade beam and floor slab together to form the building foundation without forming and placing each separately. A crane where the hoist and trolley ride on a single S-shaped runway beam. Similar to an underhung crane, except a Monorail has only one runway beam and no bridge span and is limited to movement in one axis. Buildings consisting of more than one span across the width of the building. Multiple gable buildings and single gable buildings with interior columns are examples. Panels which are not generally designed to carry loads and are not normally capable of spanning between structural supports without benefit of substrate materials such as wood, metal or concrete decks. A waviness that may occur in flat areas of light gage, formed metal products. Structural integrity is not normally affected by this inherent characteristic and therefore is only an aesthetic issue. The documents normally required by the Manufacturer in the ordinary course of entering and processing an order. Oriented Strand Board (OSB) is composed of rectangular-shaped wood strands which are cross-oriented, compressed, and glued together with waterproof adhesives. OSB is often used in both residential and nonresidential construction, such as floors, walls and roof sheathing. Note: Particle Board is not considered OSB, and should not be used in roofing applications. A notch or block out formed along the outside edge of the floor slab to provide support for the wall panels and serve as a closure along their bottom edge. A number given to each separate part of the building for erection identification. Also called mark number and part number. A sheet metal section designed to direct the flow of water out through the face of the gutter rather than through a downspout. A reinforced or enlarged portion of a masonry wall to provide support for roof loads or lateral loads on the wall. A connection designed to transfer axial and shear forces between connecting members, but not moments. A design concept based on multiplying the actual loads by a suitable load factor, and using the yield stress as the maximum stress in any member, and taking into consideration moment redistribution. A rigid frame so designed that it offers rigidity and stability in its plane. It is generally used to resist longitudinal loads where other bracing methods are not permitted. A method of prestressing reinforced concrete in which tendons are tensioned after the concrete has reached a specific strength. A device for fastening items by the utilization of a patented device which uses an explosive charge or compressed air to embed the pin in the concrete or steel. Concrete in which internal stresses of such magnitude and distribution are introduced that the tensile stresses resulting from the service loads are counteracted to a desired degree; in reinforced concrete the prestress is commonly introduced by tensioning the tendons. A method of prestressing reinforced concrete in which the tendons are tensioned before the concrete has been placed. A groove or slot, often cut in a masonry wall or other vertical surface adjoining a roof, for inserting an inset flashing component such as a reglet. The resisting forces at the column bases holding the structure in equilibrium under a given loading condition. A structural frame consisting of members joined together with moment connections so as to render the frame stable with respect to the design loads, without the need for bracing in its plane. Single or multiple leaf doors that open horizontally and are supported at the bottom on wheels that run on a track. All roof/ceiling components of the building envelope that are horizontal or sloped at an angle less than 60 degrees from horizontal. Loads that are produced (1) during maintenance by workers, equipment, and materials, and (2) during the life of the structure by movable objects and do not include wind, snow, seismic or dead loads. A machine that crimps or folds adjacent edges of standing seam metal roof panels together, to form a seam. The tangent of the angle that a roof surface makes with the horizontal, usually expressed in units of vertical rise to 12 units of horizontal run. That load induced by the weight of snow on the roof of the structure. Usually obtained by taking a fraction of the "Ground Snow Load". A bracket attached to the column of a building frame which supports the runway beam for top-running cranes. The reciprocal of the U-factor (thermal transmittance). Units of R and h•ft2/Btu. Higher R-values indicate a material's ability to resist more heat flow. A nonstructural wall erected around units or curbs on a roof. Typically the framing consists of girts with a wood or metal covering attached to the frame. A single-or multi-component polymeric or bituminous-based material used to weatherproof construction joints where moderate movement is expected. The material comes in various grades: pourable, selfleveling,non-sagging, gun grade, and tapes. A geometric property of a structural member. It is used in design to determine the flexural strength of a member. The force tending to make two contacting parts slide upon each other in opposite directions parallel to their plane of contact. A fastener used to attach wall and roof paneling to the structural frame. It consists of a large diameter shank and a small diameter stud. The shank provides support for the panel rib. A chip or fragment of concrete that has chipped, weathered or otherwise broken from the main mass of concrete. A tool used by erectors to line up holes and to make up bolted connections; a wrench with a tapered handle. An alloy of steel that contains a high percentage of chromium to increase corrosion resistance. Also may contain nickel or copper. Side joints of roof panels that are arranged in a vertical position above the drainage plane of the panels or flashings. A standing seam roof system is one in which the side laps between the roof panels are arranged in a vertical position above the roof line. The roof panel system is secured to the roof substructure by means of concealed hold down clips attached with screws to the substructure, except that through fasteners may be used at limited locations such as at ends of panels and at roof penetrations. 1. A member used to strengthen a plate against lateral or local buckling. Usually a flat bar welded perpendicular to the longitudinal axis of the member. 2. A formed shape in a metal panel that reduces the effect of oil canning in the panel's flat area. Sometimes called "stiffener rib", or "stiffener flute". The surface upon which the roofing or waterproofing membrane is placed (i.e. structural deck, plywood or insulation). "Meeting the needs of present generations without compromising the ability of future generations to meet their needs." – The World Commission on Environment and Development, 1987 (U.N. Brundtland Report). Light weight deformed steel rods or wire mesh placed in concrete to resist possible cracks from thermal expansion or contraction. The time rate of heat flow through unit area of a body induced by unit temperature difference between the body surfaces. Units for C are Btu / (ft2 × °F) [Imperial system] or Watts / (m2 × °K) [SI system]. See "Thermal resistance". perpendicular direction to the slab surfaces induced by unit temperature gradient. Units for K are Btu /hour / °F [Imperial system] or Watts / hour / °K [SI system]. See "Thermal resistivity". The ratio of the radiant heat flux emitted by a sample to that emitted by a blackbody radiator at the same temperature. (Total Thermal Emittance). Values are expressed from 0 to 1.0, with 1.0 being the maximum emittance possible. A through-fastened roof system is one in which the roof panels are attached directly to the roof substructure with fasteners which penetrate through the roof sheets and into the substructure. A wrench containing an adjustable mechanism for measuring and controlling the amount of torque or turning force to be exerted – often used in tightening nuts and bolts. A metal way for wheeled components; specifically, one or more lines of ways, with fastenings, ties, etc., for a craneway, monorail or slide door. A panel configuration whose edge profile forms an open geometric form, roughly in the shape of a trapezoid. The light gauge metal used in the finish of a building, especially around openings and at intersections of surfaces. Often referred to as flashing. When contrasted, "trim" is generally more decorative, while "flashing" serves more as functional weatherproofing. A secondary waterproofing sheet material installed between the substrate and the roof panels, usually used in hydrokinetic roof construction. Some types may be self-adhering. A built environment wherein the large proportion of dark surfaces such as asphalt paving and dark roofs absorb solar radiation and radiate the heat back into the atmosphere causing higher ambient temperatures and higher pollution levels. Heat transmission in unit time through unit area of a material or construction and the boundary air films, induced by unit temperature difference between the environments on each side. Units of U are Btu / (hour × ft2). A lower U-value, means less heat flow that occurs through an assembly from the warm side to the cooler side. An architectural detail created where two roof planes intersect, usually having ridge lines at right angles to each other. A channel used to carry off water from the "V" of roofs of multi-gabled buildings. A surface marked with patches, spots or areas of different colors. In contrast to a surface having either one color or a regular pattern or texture, a variegated surface has a varied design of several colors and/or textures. Bracing system with members arranged diagonally in both directions to form an "X". See "Bracing". A member cold formed from steel sheet in the shape of a "Z".